Ultimate Edition DLC must be activated online. All product keys can be optionally activated on Origin. macOS (OS X) version is no longer available for purchase after TransGaming Inc. shut down their GameTree Mac service in 2015. Free DLC can be installed manually from the EA support site. The latest patch is Dragon Age: Origins 1.05. Applying this patch is highly recommended (GOG.com, Steam and Origin users do not need to install the patch). 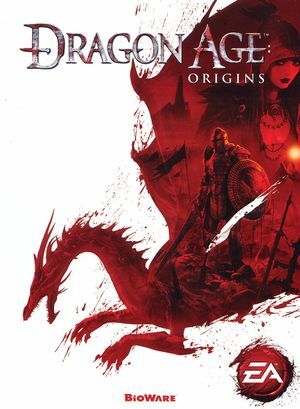 Numerous issues are fixed in Qwinn's Ultimate Dragon Age: Origins Fixpack. NTCore's 4GB patch allows you to patch the game's executable to let it use up to 4 GB of RAM (as opposed to the default 2 GB limit). You must be running a 64-bit version of Windows to properly use the patch. To patch your game, be sure to install the latest update and backup the game's executable before patching it. Works with the Origin version and the GOG.com version. The Steam version can use the exe located in this Steam guide to use the 4GB patch. Console font is the file that is often missing from the install data. Install this to make console commands visible. FtG UI Mod: By default, the game uses a small font that is difficult to read when running the game at a higher resolution. This mod increases the font's size. At higher resolutions, the text can be difficult to read. Use the FtG UI Mod. UI does not scale with resolution and is extremely small in 4K. Use the FtG UI Mod to partially improve text readability. Missing menu option. Toggle with Alt+↵ Enter. Works with Borderless Gaming. 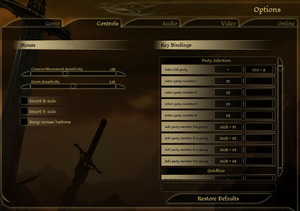 In BG settings make sure to set the resolution to your native res, to avoid inaccurate mouse placement. 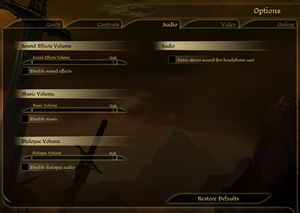 The option in DragonAge.ini appears to do nothing. Force through the GPU control panel instead. Under Nvidia Inspector, use antialiasing compatibility bit 0x004010C0 to utilize SGSSAA for an Nvidia graphics card. You may need to manually add resolutions wider than 16:9. Change ResolutionWidth= and ResolutionHeight= to the resolution you want. See also Helix Mod: Dragon Age:Origins UPDATED. The Ultimate Edition of Dragon Age: Origins sometimes crashes upon exiting. Steam users have been compiling a list of in-game bugs on the Steam Forums. Some bugs, and their solutions, may be listed there. If you are having issues logging into Dragon Age: Origins with your EA Account it is most likely because you have special characters (like "#") in your password which the game does not support. You will need to change your EA Account password to one without those special characters if you want to log in. Open DAOriginsConfig.exe and disable Fullscreen mode. 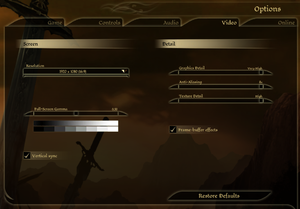 You can activate Fullscreen from the options in-game. Log in in-game with internet access to authenticate the current DLC. Log out of the account in-game. Ensure "always log me in" is unchecked. Continue playing normally. If you add more DLC repeat these steps to authorise it for offline use. ↑ 1.0 1.1 File/folder structure within this directory reflects the path(s) listed for Windows and/or Steam game data (use Wine regedit to access Windows registry paths). Games with Steam Cloud support may store data in ~/.steam/steam/userdata/<user-id>/47810/ in addition to or instead of this directory. The app ID (47810) may differ in some cases. Treat backslashes as forward slashes. See the glossary page for details.